"I will dwell forever, in the Station House of The Lord"
COLUMBIA, Mo 2/23/14 (Remembering) -- Seventeen years ago next month, Columbia firefighter Bruce Britt "led a saddled, riderless horse around the ring to the bowed heads and quiet thoughts of those in attendance at Midway Exposition Center," the Columbia Daily Tribune reported. Britt was attending a memorial service for Clayton Gray, a lieutenant who served 18 years with the Columbia Fire Department and 25 years for the Boone County Fire Protection District until his death from cancer. "Outside the double doors that lead into the arena, a fire truck sat, its mammoth size silent without its former leader." 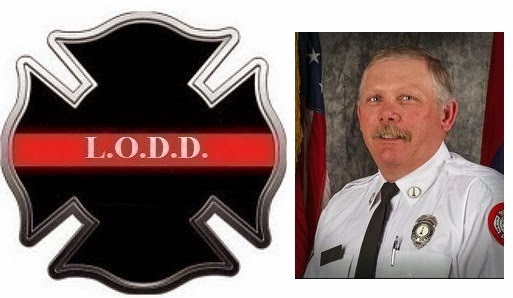 Now, Columbia remembers Britt himself, another Columbia Fire Department lieutenant, who died in the line of duty after a walkway collapsed at University Village Apartments yesterday. Lt. Britt was part of a team that went to New Orleans after Hurricane Katrina. Closer to home, he helped recover a man who waded into a pond, but never came back. He "always did the right thing, whether it was with orders or against orders -- and took the necessary heat," a co-worker remembered on Facebook. Britt was one of the reasons I wrote, "They risk their lives through flames and smoke to save our lives," about firefighters, at the top of my list of the best public services Columbia City Hall provides. "These men and women do the most consistently dangerous job in town with calm and finesse." In the end, Bruce Britt was a family man, to his wife Leigh, daughters Katlyn, Katryna, and Stormy Ann; to the community he gave his life to protect. And to brother firefighters like Lt. Clayton Gray, whose memory Lt. Britt honored all those years ago. "On behalf of all residents of the City of Columbia and the City Council, I extend our deepest sorrow and condolences to the Britt family," Mayor Bob McDavid said. From Britt's friends, personal memories pour onto a Facebook page in his honor. "Thank you Sir, for your services and all of your kind words when you came in University of Missouri Children's Hospital ER." "Our girls loved riding with Bruce in the Christmas parade on the wagon. Thank you Bruce for such great memories." "I was blessed to have been able to count him as one of my friends." "It's just as he would have it," another friend wrote under the photo at the top of this page, which Britt posted online the day before he died. "He went living his dream." Fellow firefighters around the nation left this comforting refrain: "Rest Easy, Brother. We Will Take It From Here." The Lord is my Chief. He has chosen me to serve. He leads me to fires raging around me. He restores my soul for the fight. He has prepared a place for me in this life: Devoted to honor, service, duty and fellowship. He appoints my soul with courage to fight in the presence of our enemy, Fire. Yes, even though I have chosen this life, in the shadow of death, I will fear no fire, for God is with me. His goodness and strength comforts me. And when life’s final alarm for me has sounded, I will dwell forever, in the Station House of The Lord.